Nathan Boughton Warren, The Holidays: Christmas, Easter, and Whitsuntide; together with the May-day (Troy, NY: H. B. Nims and company, 1876), pp. 105-117. The custom of serving the boar's head with minstrelsy at the Christmas dinner, with more or less of the ceremonies still used at Queen's College, Oxford, was very general in England previous to the civil wars of the seventeenth century, not only in the halls of the Universities, but also in the houses of the nobility and gentry. According to Aubrey, — "The first dish that was served up in the old baronial halls, was the boar's head, which was brought in with great state, and with minstrelsy; and between the flourishes of the heralds' trumpets, carols were chanted forth." Perhaps the most splendid example of Christmas banqueting of this kind of which we have read, is that recently illustrated by Gilbert, which took place in the reign of Henry VII., in the great hall of Westminster. To this feast the Mayor and Aldermen of London were invited, and all the sports of the time were exhibited before them in the great hall, which was hung with tapestry; "which sports being ended in the morning, the King, Queen, and Court sat down at a table of stone, to one hundred and twenty dishes, placed by as many knights and esquires; while the Mayor was served with twenty-four dishes and abundance of wine. And finally, the King and Queen being conveyed with great lights into the palace, the Mayor with his company, in barges, returned to London by break of next day." Above: King Henry VII Keeping Christmas in Westminster Hall, circa Twelfth Day, 1494. Artist: Gilbert. From "The Illustrated London News," December 20, 1856. "At diner beinge sett downe in ye Hall at ye high table in ye Vice Præsident's place [for ye Praesident himself was then allso p'sent] hee was serued wth 20 dishes to a messe, all wch were brought in by Gentlemen of ye Howse attired in his Guard's coats, vshered in by ye Lrd Comptroller and other Officers of ye Hall. And so yu are wellcome all." The ceremony still observed in Queen's College, Oxford, differs but little from the above. The custom has probably been observed since the foundation of the college in 1340. The Boar's Head,1 highly decorated with bay, holly, rosemary, etc., in a large pewter dish, is slowly borne into the hall by two strong servants of the college, who hold it up as high as they can, that it may be seen by the visitors ranged on either side of the hall. The gentleman who sings the ancient carol, or " Boar's Head Song" (generally one of the members of the college, though sometimes one of the choir of Magdalen College), immediately precedes the Boar's Head, and as he commences the song with, "The Boar's Head in hand bear I," touches the dish with his right hand. Two young choristers from Magdalen College follow, to sing conjointly with many of the junior members of Queen's College, the chorus, "Caput apri defero," etc.2 The dish is carried as before stated, to the high table, where sit the Provost, Bursar, Fellows, and others, and at which many visitors are congregated. 1. Brawn, decorated with bay and rosemary, has been substituted for the Boar's head. The following traditional receipt we give as we had it from an English lady. "Brawn. — Take a pig's head and soak in salt and water all night, scrape and well clean the head, removing the brains and eyes. Boil until tender enough to take the bones out easily. When quite tender pick the meat from the bones and chop fine, seasoning to your taste, with red and black pepper, cloves, mace, nutmeg, and salt; mix well together and put in a press. Let it remain until cold." 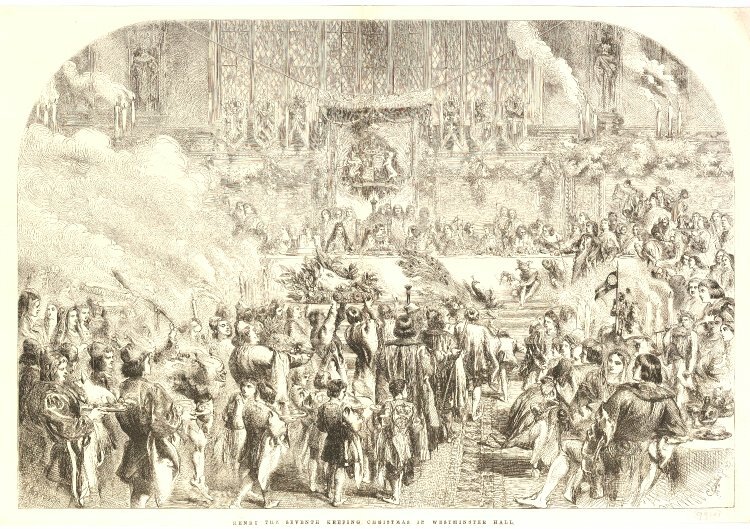 The places where now the boar's head ceremony is specially observed, by bringing in the gigantic dish in procession, with song and chorus, on Christmas Day, are Queen's College, Oxford; St. John's College, Cambridge; and the Inner Temple, London. There has been also, elsewhere, and even in this country, successful attempts at a revival of this ancient ceremony. At the opening of the New Rooms of the Century Club of New York, on Twelfth-Night, 1858, there was a pageant similar in character. The ceremonies on the occasion were like those enacted in the Inns of Court, in the sixteenth' and seventeenth centuries. The writer was told by those who were present that everything was done according to ancient custom, the decorations of the spacious apartments and the costumes were very picturesque, and the ancient cookery decidedly good. The schoolroom with its arched fireplace and blazing yule-log presented quite the appearance of an antique baronial hall. Various accounts have been given of the origin of this ancient custom of bringing in the boar's head. By some it is said to have originated with the Romans, who served up the wild boar, sometimes in parts, and sometimes the entire animal, as the first dish at their feasts. With a boar so bryme " (fierce). And reft from him both life and limb. And all rejoice as one." As he was a jovial hunter. To Sir Ryalas, the jovial hunter. From Sir Ryalas, the jovial hunter. For he was a jovial hunter." Editor: the full poem can be found in Francis James Child, English and Scottish ballads, Volume 8(Boston: Houghton, Osgood and company, 1880), pp. 145-147. 3. See Chambers' Book of Days. "Tradition presents this usage as a commemoration of an act of valor, performed by a student of a college, who, walking in the neighboring forest of Shotover, and reading 'Aristotle,' was suddenly attacked by a wild boar. The furious beast came openmouthed upon the youth, who, however, very courageously and with a happy presence of mind, is said to have rammed in the volume and cried, 'Gæcum est' (it is Greek); fairly," adds the Dean, "choking the savage with the sage." Perhaps this manner of disposing of two enemies at once was considered by the Oxonians of that day an event worthy of a particular commemoration; the Greek philosopher, in their estimation, being the most dreadful bore of the two. But whether or not the modern philosophy which succeeded that of Aristotle in this University derived its name " Baconian " from this combat, has not, it appears, been yet decided. Possibly the youth mentioned by the Dean may have acquired the surname of " Bacon" from this exploit, and so transmitted it to posterity with the "inductive" or " Baconian system." The crest of Lord Bacon — the wild boar passant — with the motto "mediocria firma" seems to indicate something of the kind. However, the valorous exploit was commemorated by the patron of the student in a stained glass window in Horspath Church, near Shotover. A taberdar,4 an officer peculiar to Queen's College, is there represented holding on a spear the head of the boar he had slain. 4. "Taberdars are officers peculiar (it is said) to Queen's College ; their duties appertained to the refectorium, or dining-hall. One of these students in office, in earlier centuries, was returning home through Shotover Forest, after a day spent in recreation, and for safety against wild things, he carried a spear. Jogging homeward leisurely, it pleased him to lull the distance with a page or two of the MS. Aristotle, which he had slung in the folds of his vestment. Thus occupied, and all insecure from foes, biped or quadruped, he was terrified to find that a savage boar was at that instant thrusting itself offensively in his path. The scholar suddenly halted. The boar did likewise. The scholar extended his jaws to raise an alarming cry, and the boar followed the example. Pursuing his advantage, — the man who could study Aristotle in those days was not likely to be blamed for stupidity, — as quick as speech the taberdar thrust the volume, vellum, brass, and all, into the animal's throat, and then finished the business with the spear, whilst his opponent was digesting his classics. "The scholar's patron commemorated the event in the windows of Horspath Church." — Wanderings of a Pen and Pencil. But to return to the subject of the banquet. The dinner would have been thought very incomplete without the appearance of another famous dish peculiar to the season — the Christmas pie — which like the boar's head was anciently served with minstrelsy. This dainty dish fit "to set before a king," was quite a bill of fare in itself, — fish, flesh, and fowl were to be found beneath its ample crust. We read that, "In the 26th Henry III., the Sheriff of Gloucester was ordered by that monarch to procure twenty salmon to be put into pies at Christmas; and the Sheriff of Sussex, ten brawns, ten peacocks, and other items for the same purpose." The peacock was only produced at solemn and chivalric banquets, such as that of Christmas, and when thus served up, with gilded beak and plumed crest, his head appearing at one end of the pie, and his tail at the other, spread out in all its glory, was carried in state into the hall to the sound of minstrelsy, by the lady most distinguished fpr birth and beauty, the other ladies following in due order. "For to make a moost choyce Paaste of Gamys to be eten at ye Feste of Chrystemasse (17th Richard II. A. D. 1394)." A pie so made by the Company's cook in 1836, was found excellent. It consisted of a pheasant, hare, and capon; two partridges, two pigeons, and two rabbits; all boned and put into paste in the shape of a bird, with the livers and hearts, two mutton kidneys, forcemeats, and egg-balls, seasoning, spice, catsup, and pickled mushrooms, filled up with gravy made from the various bones. "On Monday last was brought from Howick to Berwick, to be shipped for London, for Sir Henry Grey, Bart., a pie, the contents whereof are as follows, viz. : 2 bushels of flour, 20 lbs. of butter, 4 geese, 2 turkies, 2 rabbits, 4 wild ducks, 2 woodcocks, 6 snipes, and 4 partridges, 2 neats' tongues, 2 curlews, 7 blackbirds, and 6 pigeons. It is supposed this very great curiosity was made by Mrs. Dorothy Patterson, housekeeper at Howick. It is near nine feet in circumference at bottom, weighs about 12 stone; will take two men to present it to table; it is neatly fitted with a case and four small wheels to facilitate its use to every guest that inclines to partake of its contents at table." The Christmas pie in these days has come to be known as mince pie, the term, according to the learned Dr. Parr, having been given to it by the Puritans in derision. Anciently this pie was baked in the form of a crache or manger, the crossed bands at the top being traditionally considered to resemble the manner in which a child is secured in its crib. Its various savory contents had, it is supposed, some reference to the offerings of the Magi. Indeed, our mince pie has laid the whole world under contribution: the East and West Indies furnishing the spices and sugar; Greece and Malaga their currants and raisins; the North its choicest fruit, and the South pouring over the whole its costliest wine. There is a superstition in regard to these pies worthy of notice. It is said that in as many different houses as you eat mince-pie at Christmas, so many happy months will you have during the ensuing year. Now, as there are just twelve days of Christmas, an enterprising diner-out may thus secure twelve happy months for the New Year.